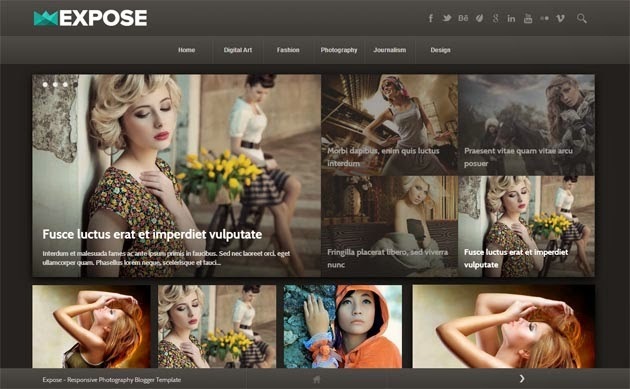 Expose is a blogger theme with responsive layout and it’s High User Friendly Blogger Template. It’s design simple and clean, perfect for a variety of purposes, although focused towards Photographers and those using Portfolios to display their past and present work collections. Requirement: You need to save your own image on Blogger rather than do hotlinking from the various sources to run this template. Setup slider : To add images to slider you need to include " Feature " label into your blogger post. Now Replace Green color Facebook page url with your facebook page url. Now Replace Green color Google+ page url with your Google+ page url.